I’ve been living in India for a little over a full year now, so I thought that this would be an appropriate time to review my “India To-Do List”, and to reflect on my time spent in India so far! Learn to drive – So that I can retain some measure of independence and self-sufficiency. I’m embarrassed to say that I still haven’t learned to drive here. It’s just so easy to get around otherwise! I’m still determined to master these Delhi roads, though. Become conversational in Hindi – So that I can understand group conversations without asking for an English translation. I’m improving in this. My comprehension of Hindi has improved drastically, to the point where I can follow most of a conversation, especially if there are a few English words thrown in. My speaking ability is okay. I use Hindi primarily with taxi and rickshaw drivers, shopkeepers, and our maid. I’m shy about speaking Hindi with friends and family, though, because I’m embarrassed by my American accent. Learn Indian cooking – Something I’ve always wanted to learn, and what better place than in India itself! This one I’m also working on. On the days that I’m home for lunch, I hover around the kitchen and take notes on what our maid is doing. I have yet to try to duplicate any of her recipes on my own, though. However, I have been teaching our maid how to make non-Indian dishes, including pancakes, really delicious pasta sauces, and casseroles! Ride Delhi’s Metro – Said to be one of Delhi’s best forms of public transportation. Completed Aug. 28th, 2010. Click here to read more! The Metro has actually become one of my favorite ways to commute to and from work. It’s clean, efficient, and reliable, and I would recommend it to anyone. Jain Bird Hospital, Old Delhi – The idea of a bird hospital sounds so sweet to me! Completed Aug. 28th, 2010. Read more here. Chandni Chowk, Old Delhi – Delhi’s oldest and busiest market. Completed Aug. 28th, 2010. Read about it here. Jama Masjid, Old Delhi – Every image I’ve seen of it is always breathtaking. Completed Aug. 28th, 2010. Check it out here. Baha’i Lotus Temple – Often compared, architecturally, to Sydney’s Opera House. Completed Aug. 27th, 2010. Click here to read more! National Gandhi Museum – It commemorates Gandhi’s life, and even has a few of his personal artifacts. Completed Feb. 1st, 2011 when I was showing a group of people around the city. We were even lucky enough to see the live khadi-spinning demo! I have yet to visit Palika Bazaar, Jantar Mantar, and Safdarjung’s Tomb, but otherwise I managed to see the rest of the sites on my list (and many of them more than once)! In fact, Old Delhi has become one of my favorite parts of the city, and I love to share it with newcomers and visitors. Srinagar – Unlikely that I’ll visit now due to political unrest, but I hope to sometime in the future. Completed June 7th, 2011, when my husband and I traveled there for a three-week vacation in the Himalayas! We spent half of the time in Srinagar, and the other half in Leh. Both places were beautiful, and offered a much-needed break from Delhi’s heat. During the year, there were also plenty of things that I accomplished that weren’t on my list. 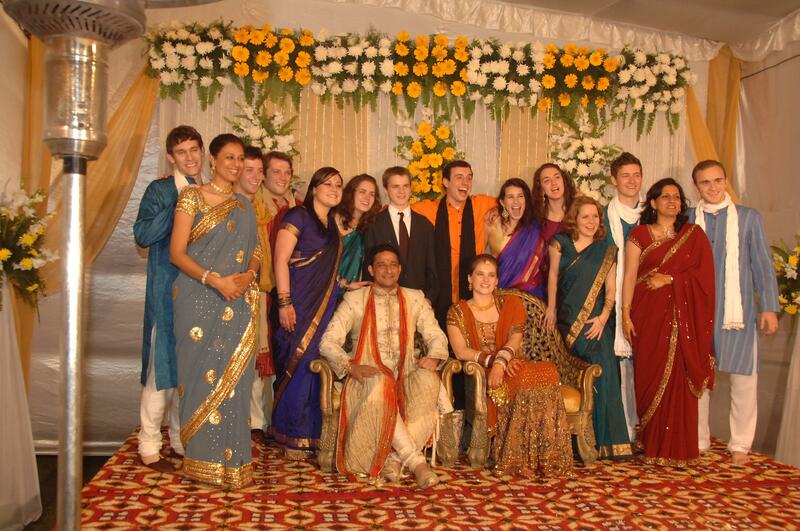 The largest accomplishment, by far, was the multi-day Indian wedding that Amrit and I managed to pull off in December! 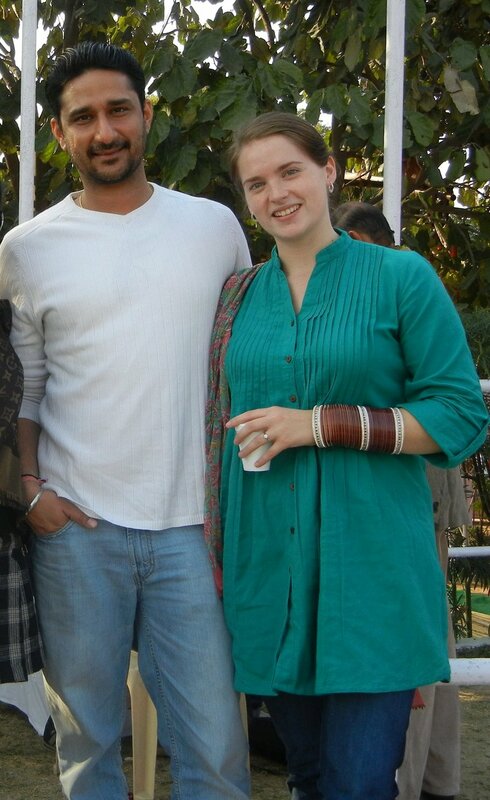 We’ve now settled comfortably into married life in India, and are enjoying our time together as newlyweds. In addition to that, all of my time spent in Indian gyms has paid off, and I’ve lost quite a few kilos (or pounds, for my American readers out there…) And then there are smaller, subtler accomplishments that I see in my daily life – in my increasing comfort with the way things are done in India, and also in my ability to begin to incorporate the things that I loved doing in the U.S. into my life here. I see myself becoming more familiar with the neighborhoods and markets in Delhi, and learning how and where I can find certain things like imported foods, fine wool and knitting needles, and seed packets and gardening tools, and then using that knowledge to do the things that I used to love, like cooking and baking the dishes I grew up eating, taking up knitting projects, and planting flower and herb pots for our home garden. This is only just the beginning, though! I’m already a few weeks into my second year in India, and have already begun thinking about what I would like to do, see and accomplish this coming year. I’m revising my “India To-Do List” for this year – there are a few things that I’m carrying over from this previous list, but otherwise this is a new set of goals and things to do and see in the year to come! After the music and dancing had finished, we all settled in for the ceremony. Amrit and I were seated on cushions around a fire pit with the priest and our immediate families. All of the other guests sat or stood in a larger circle around us. Unlike a traditional church-wedding in the U.S., in which guests are expected to sit quietly and respectfully through the whole ceremony, our Indian wedding ceremony was much more relaxed. The guests were chatting and enjoying snacks and chai as we went through the ceremonial offerings to the fire, and as Amrit and I completed our seventh and final procession around the fire and he applied sindoor to my forehead, signifying that we were now married, the guests cheered and threw flower petals and rice grains on us! After the ceremony, which lasted a little less than one hour, we all went to the wedding reception. Often, an Indian wedding ceremony and reception occur on different days, since the ceremony is supposed to happen at the auspicious hour of 4 AM, and the reception follows the day after. For the sake of our guests from the U.S., though (and, frankly, for the sake of our own sleep), Amrit and I decided to skip the 4 AM wedding and separate reception, and combine them into a one-day event. The reception was fun, though exhausting. Amrit and I had to do a mix of mingling, posing for pictures on a stage that was set up specifically for guests to take photographs with the newlyweds (I felt like a celebrity! ), and snarfing down food and drink when we found a spare second. I was happy to see all of the guests enjoying themselves, though, and was thankful that we had managed to pull off this elaborate wedding extravaganza that, in the initial stages of planning, had seemed like such an overwhelmingly daunting task. And I was most relieved that it was all over, and that I could finally go home and sleep easy knowing that there was no more wedding pressure looming over my head! Finally, the big day had come! 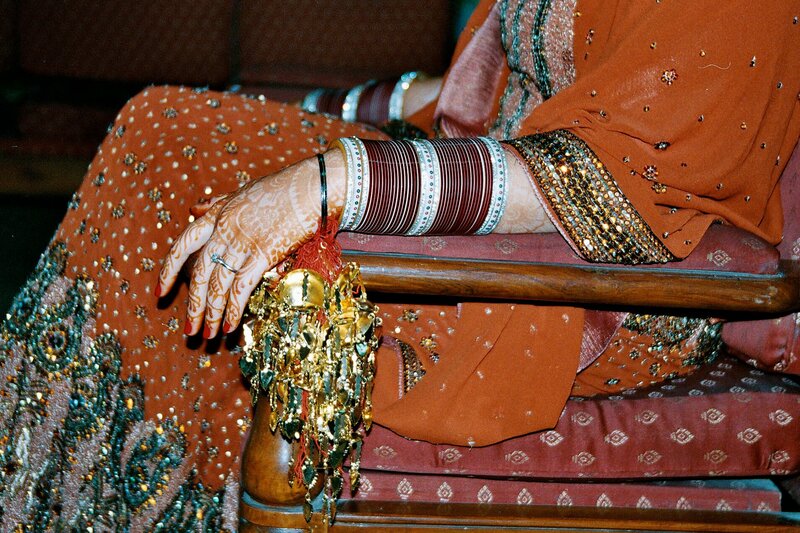 I rolled out of bed on December 29, 2010 – the morning of my wedding – to get ready for the chuda ceremony, the ceremony in which a Hindu priest places the traditional red and ivory bangles on a bride. The ceremony was conducted in the presence of my friends and family. 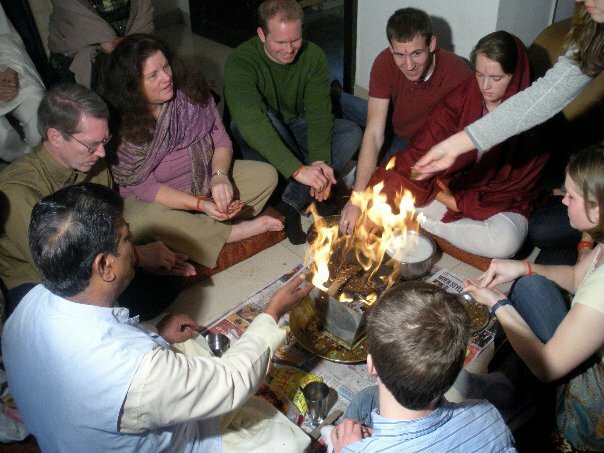 The priest lit a sacrificial fire (a havan), which is traditional for most Hindu pujas, or prayer ceremonies. We gave offerings of sandalwood and ghee to the fire, and the male relatives of my family washed my hands in milk before sliding the chuda, which were also soaking in the milk, onto my wrists. 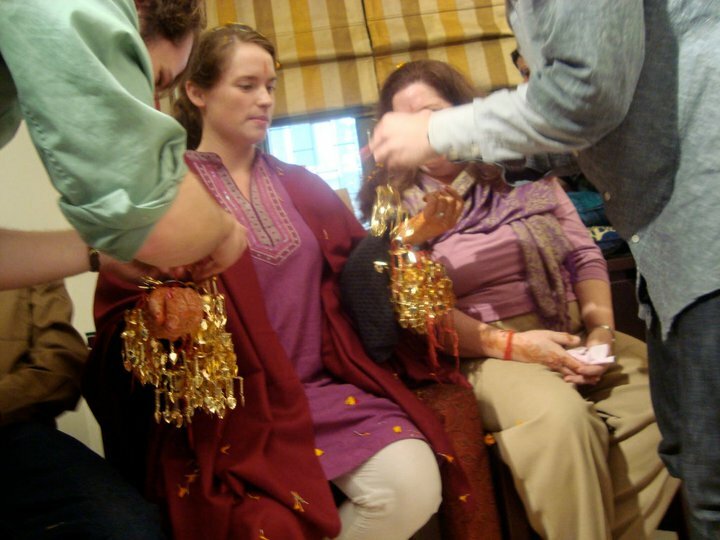 It’s inauspicious for the bride to see the chuda before the wedding, so I had scarves tied around each of the chuda sets on my wrists to cover them. After that, my friends and family members came up one-by-one to tie kaliray, or blessings, to my wrists. It was really touching to be able to have that one-on-one experience with each person who had traveled so far to be there with me on my wedding. 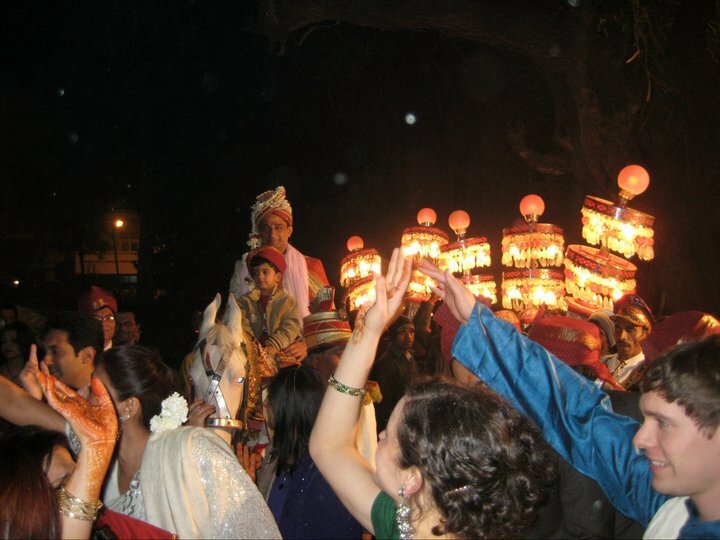 After the chuda ceremony, the priest left for Amrit’s home where he would perform the sehra bandi, a similar ceremony for the groom in which his family members give him their blessings for the marriage, and his sisters tie a veil of flowers to his head. Meanwhile, I went off the to the beauty parlor for a three-hour session complete with hair, make-up, and proper draping of my lehenga and dupatta. The parlor did a great job and I left feeling like a proper maharani (an Indian queen). With my mom, sister, and a close friend, I drove (getting many stares from passing drivers along the way) to the temple where the wedding ceremony would take place. Continue reading: Wedding Daze, Pt. 2. 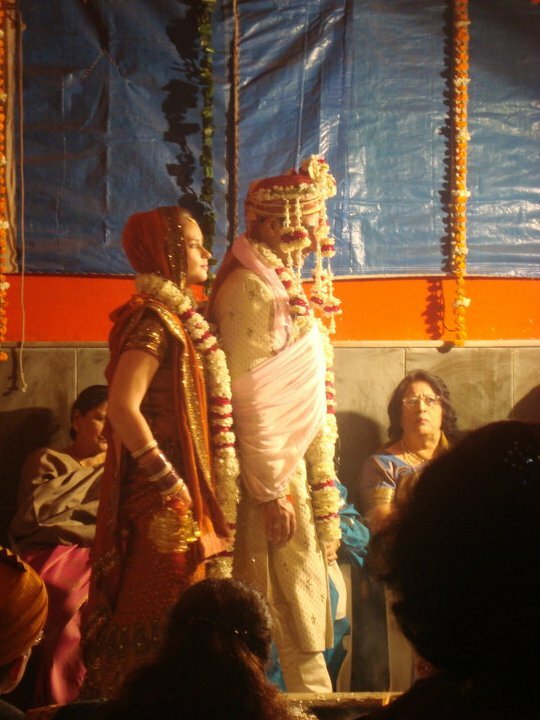 On December 28th, 2010, the day after our cocktail reception, I had my bridal mehndi and Amrit and I hosted our sangeet. Normally, the mehndi and sangeet are held on separate days, but for the sake of time, Amrit and I decided to have both parties on the same day. My mehndi ceremony began in the early afternoon. 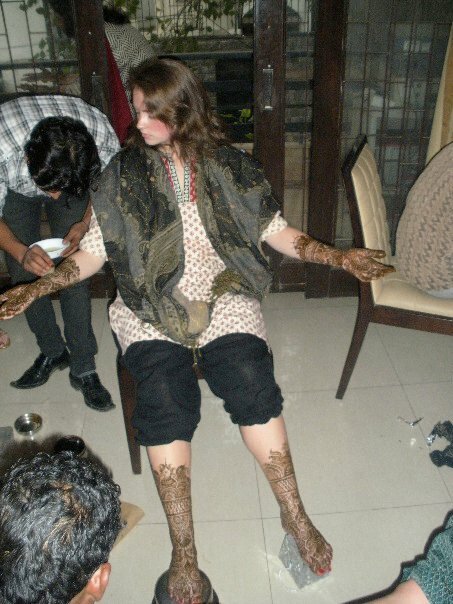 It’s during the mehndi that artists paint beautiful designs using henna paste on the bride’s hands and feet. I’ve had henna put on before, but this was by far the most extensive – I had three different people applying the paste simultaneously, and it took about two hours to cover my hands, arms, feet, and legs! Female friends and relatives of the bride also come together to sing songs and have henna applied. Overall, it was a very fun, girly kind of party. We even had baskets of bangles so that the women could pick some that would match with their saris for the wedding! Once everyone’s henna was in place, we applied a paste of lemon and sugar to really make the color soak in, and then all had to sit and wait for it to dry – about four hours! We made good use of the time, though, by chatting and watching Bollywood music videos in preparation for all of the singing and dancing that was to come later in the evening. Since the sangeet is the traditional music and dance ceremony of an Indian wedding, my female friends and I decided that, while our henna was drying, it would be fun to choreograph a short dance to show the rest of the guests. We chose the song “Sheila ki Jawani” from the film Tees Maar Khan, which was the most popular song on the radio at the time. After drawing inspiration from a few Bollywood music videos, we were well under way in our rehearsals, and after only thirty minutes of practice we had finished our dance and were running it one last time. Imagine our surprise, then, when, during that last run, the first guest for the party arrived! We weren’t even close to being ready. No one, including myself, was dressed or made up for the party, and we hadn’t even had a chance to remove the dried mehndi paste from our skin! I quickly dashed out to the balcony to begin removing the dried paste by rubbing my hands together – a technique that I had found was usually quite effective in removing most of the henna. I became frantic, though, when none of it came off. The lemon and sugar paste that we had applied earlier was doing more than deepen the color – it had turned into a kind of glue that made the dried henna stick stubbornly to my skin! Fortunately, I had some very resourceful friends with me, as well as a kitchen with several utensils at my disposal. I soon had a small army of girls scraping away at the mehndi on my arms and legs with the sides of forks and the backs of knives. (All the while we were cracking jokes about the importance of having bridesmaids.) It was somewhat uncomfortable to have my skin scraped, but it was even more awkward when more guests arrived only to find the bride standing outside, not in the least bit ready for the party, with friends scraping away at her! After ten minutes of diligent work, though, most of the mehndi was removed, and my friends and I scurried upstairs to get ready. And after that little hiccup at the beginning of the party, everything went wonderfully. Our dance performance was well-received (Amrit’s family even made us perform an encore! ), and it kicked off a fantastic night of music and dancing with our guests. The cocktail reception, the first of our official wedding events, was held on the evening of December 27th, 2010. The cocktail, in our case, was meant as a meet-and-greet for the bride’s and groom’s friends and family, and it kicked off the rest of the wedding celebrations. Our cocktail took place in Delhi’s Air Force Golf Club Banyan Court. 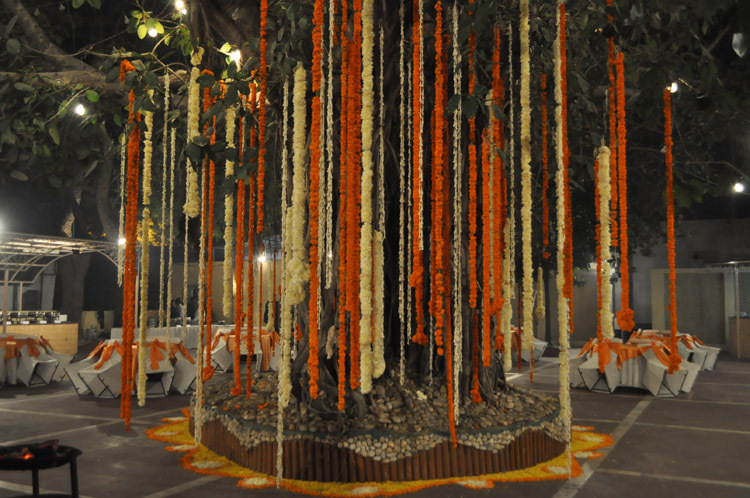 The 200-year old Banyan tree provided a beautiful backdrop for what turned out to be a lovely evening. After all of the frantic days leading up to the wedding, it was a pleasure to spend the evening enjoying delicious food and good company. 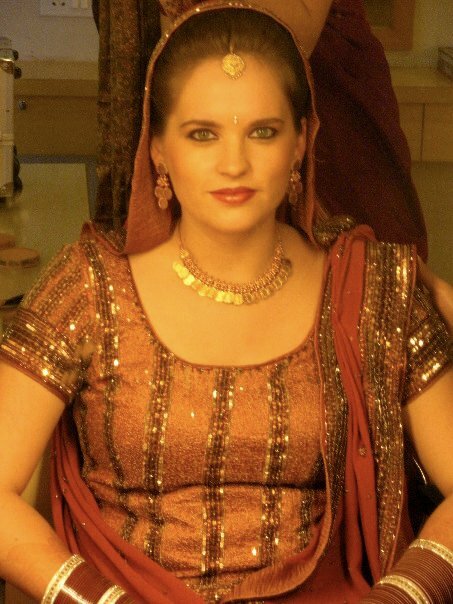 I also felt like a princess in my green kundan work (jeweled) sari and matching jewelry!